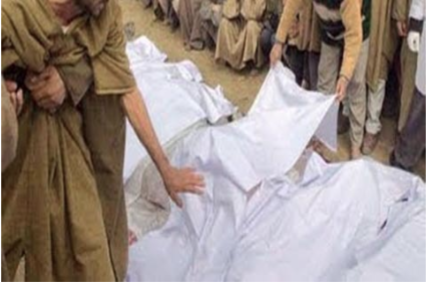 On 23rd March 2003, Kashmir’s Hindus witnessed yet another in a long list of massacres of their men, women and children at the hands of Jihadi ghouls. Late in the night, a party of LeT Jihadis entered the small hamlet of Nadimarg. Nadimarg was one of the very few hamlets left in Kashmir valley that still housed Hindus. 54 Hindus still lived there, and these were the targets of the LeT Jihadis. The terrorists entered wearing fake army uniforms. However, the fact that they were wearing civilian boots, and speaking fluent Kashmiri made some of the Hindus suspicious, and some of them fled into the nearby fields and hid. Their suspicions were to be proved right, as soon the shrieks and blood-curdling cries began as the Hindus were dragged out of their homes and shot dead with automatic weapons. The bodies of the 24 Kashmiri Hindus lined up after the massacre. The Jihadi ghouls missed 2 Year Monu. However, this little child shrieked AFTER the Jihadis had left the hamlet. Hearing this, the Jihadis returned to the hamlet, not to miss the opportunity to kill newborn Hindu blood, and sprayed his chest with AK-47 fire. Monu became yet another little child slaughtered by Jihadis in Kashmir’s long night for Hindus. Many other little children had been slaughtered before him. Today, all media outlets are making programs on the innocent 12-year-old Atif Mir – the hostage who was killed by LeT ghouls using him as a human shield in a gunfight with security forces recently. However, no one remembers 2 year old Monu, who also died on the same day, 16 years ago. This article is for him.